If it starts raining cats and dogs, just remember: get a grip. Ensure your tires can handle wet weather. Invest in a pair of warm wristlets, gloves, or pretty much anything you can get your hands on – or in. Heated grips are great. Fleeces are a must – no need for anything fancy, just warm. There are more collisions with deer in autumn than any other time of the year, so keep your eyes peeled – especially at dawn and dusk. Use a trickle charger, aka “optimiser”, to maintain your bike’s battery so it doesn’t run out of juice on a cold night. Brake pad residue that builds up in wet weather can affect your stopping power, so ensure you clean your calipers regularly. The coming of autumn guarantees one thing: leaves. Lots and lots and lots of leaves. Which might be great for moody Insta-snaps, but not so great for grip. So look out on country roads. Baby wipes are great for cleaning your lights when you’ve hit a patch of rain – and they’re just as good for your saddle, chrome and paintwork. Black leathers. Stylish? Yes. Safe? Not so much. Due to shorter days, fog, rain, etc. in autumn and winter, motorcyclists are a lot less visible. So fix up, look sharp and wear a reflective jacket. 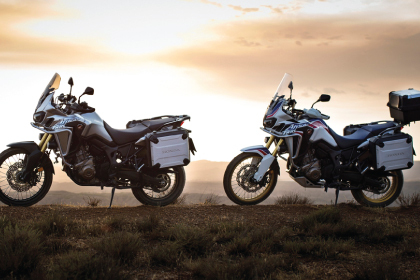 Last but not least, here are the top three rules for riding in adverse weather conditions, courtesy of Simon Carter, Motorcycle Sales Manager for Northwest Honda: “1) Maintain a longer braking distance; 2) stick to smoother lines when cornering; and 3) be soft on the throttle.” Remember: safety first.